“The Jeffer” Jeff Heotzler is a Northeast DIRT Modified Hall of Fame driver who is widely considered to be among the best who ever wheeled the mighty 800+ horsepower machines. His career began back in 1978, when a hot-lap session in his brother Ralph’s #17 coupe at the famed Orange County Fair Speedway turned into a now 5 decade obsession with dirt track racing. 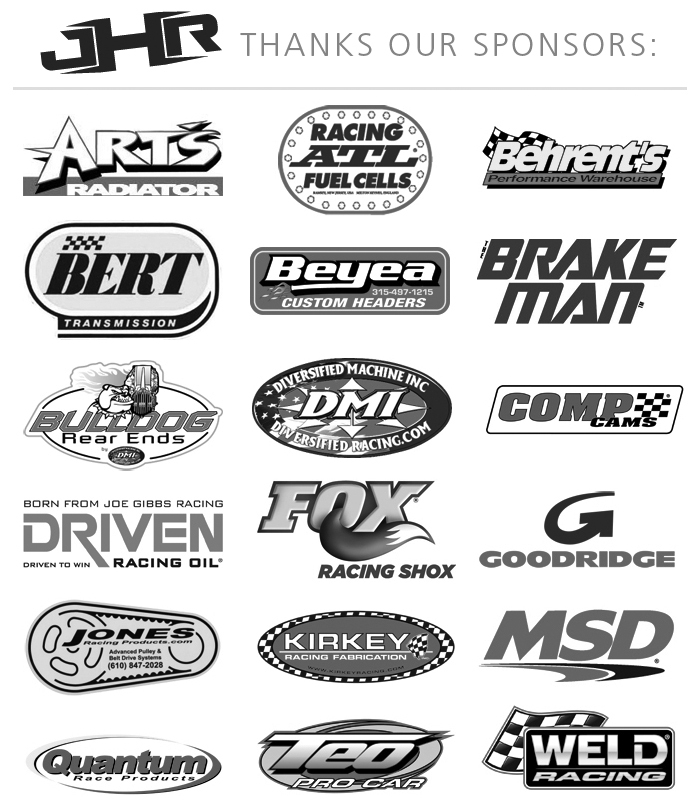 Over the years, “The Jeffer” has amassed over 150 wins, 11 track championships, and one Mr. DirtCar 358 series championship all while gaining the respect of his peers and building a legion of loyal fans. Today, at age 60, “The Jeffer” remains competitive as ever and is still finding his way to victory lane. Family: Wife, Petra Son, Jeff Jr.
“The Jeffer” climbs aboard his brother Ralph’s race car for the first time ever at the Orange County Fair Speedway – The rest is history. “The Jeffer” celebrates career victory #1 aboard the Ken Slingerland owned #25 car. The early days in black and white. Jeff Heotzler in the Slingerland 25. Jeff and Ralph Heotzler pose for a photo. “The Jeffer” in the famous Higbie Bros. 97. Jeff Heotzler pilots the Kisacky/Castle 7 at the Lebanon Valley Speedway. “The Jeffer” is victorious over dirt track legends Jimmy Horton and Danny Johnson. “The Jeffer” at the Syracuse Mile in his J17. A checkered flag for the J17 machine. “The Jeffer” grabs another victory at the Accord Speedway. “The Jeffer” pilots the Diet Pepsi sponsored Smith Bros. 74 to victory at OCFS. “The Jeffer” and son Jeff Jr. in victory lane at OCFS. Heotzler, Mckee, and Rogers at OCFS. The 74 team celebrate an Eastern States 358 Modified victory at OCFS! “The Jeffer” in the sharp looking #74 asphalt series car. “The Jeffer” and the Smith Bros. 74 team on the grid at Syracuse. “The Jeffer” came within 5 car lengths of winning the 1997 Syracuse 200 Championship. “The Jeffer” in victory lane at the Rolling Wheels Raceway. 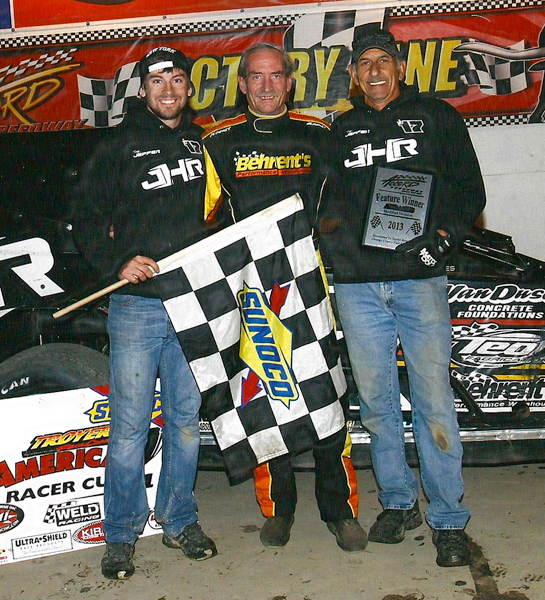 “The Jeffer” and the Reclamation crew celebrate a win at the Albany-Saratoga Speedway. After 20 years, the crown finally fit as “The Jeffer” captured his first ever OCFS Modified Championship! “The Jeffer” in the beautiful Reclamation #33 at OCFS. Jeff pilots the Sparts Trucking 673 at the Rolling Wheels Raceway. “The Jeffer” in victory lane at OCFS. “The Jeffer” in the Mike Sparta Trucking 673 at OCFS. “The Jeffer” on track with son, Jeff Jr. at OCFS. “The Jeffer” wins the Gamblers Classic TQ Midget Championship at Boardwalk Hall in Atlantic City. “The Jeffer” in victory lane at OCFS aboard the Atlas Paving 66. “The Jeffer” is all smiles in victory lane after capturing the elusive Eastern States Championship. 2007 OCFS Eastern States 200 Champions! The Atlas Paving 66 at OCFS. “The Jeffer” takes the Bob Dini 49er to victory lane at OCFS. “The Jeffer” captures OCFS Modified win #47 aboard the Hollywood Racing #93H.